Don Dunstans views about Australia, a country he loved, when he was still Premier of South Australia. 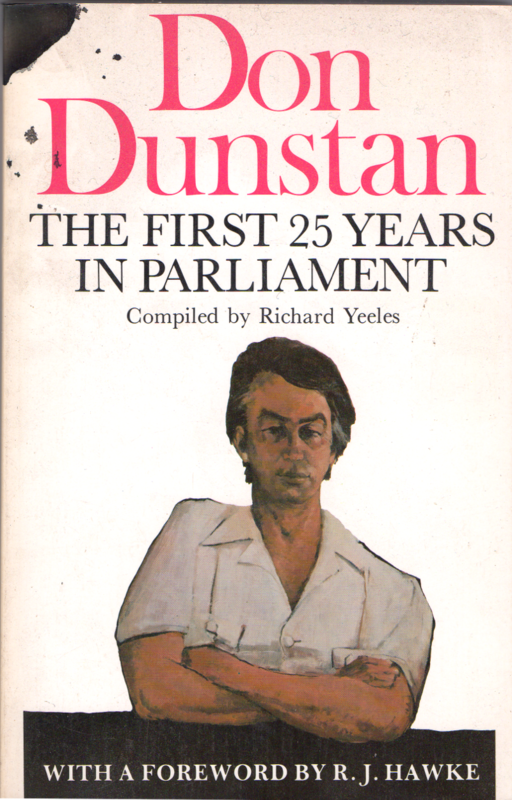 When a political personality captures the public imagination as strongly as Don Dunstan, and when his twenty-five-year long parliamentary career has been marked with remarkable bursts of oratory, a book of quotations is inevitable. Richard Yeeles has selected carefully and objectively. He gives us not only the best quotes from Don Dunstan, but also the best possible glimpse of the man behind the words. The opinions of others, in opposition as well as support, are essential to such a view and have not been neglected. In his short preface the author reminds us of Lord Keynes' remark that 'Words aught to be a little wild for they are the assault of thoughts on the unthinking', and, in regard to the many lively assaults in the career of Don Dunstan he offers the summary comment: Judgement aside, few people have been left unthinking'. Whatever the politics of Don Dunstan may mean to the reader, the quotations within this book will be thought provoking. Richard Yeeles, born in the industrial north-east of England, has spent half of the last twenty-five years in Australia, completing his schooling, a cadetship in journalism with the Australian Broadcasting Commission, and four years with the South Australian Government Department of which his subject is ministerial head. The idea for this book originated in the years 1970-4 when Yeeles was a Parliamentary reporter with the ABC. The Premieral performance of those years provoked admiration, sometimes astonishment, always awe. After leaving politics Dunstan published his political memoirs "Felicia" in 1981. He became the first director of Tourism Victoria in 1982, and then chairman of the Victorian Tourism Commission until 1986. He was national president of the Freedom from Hunger Campaign 1982-87, president of the Movement for Democracy in Fiji from 1987, and national chairman of Community Aid Abroad 1992-93. Always interested in food, and the author of a cookbook in 1976, he established, in 1994, the Don's Table restaurant, The Parade, Norwood, with partner Steven Cheng. He was an Adjunct Professor at Adelaide University from 1997-1999.